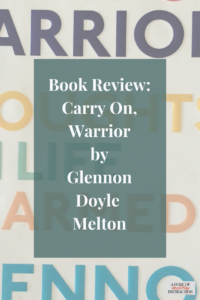 Confession: I have been a fan of Glennon Doyle Melton for a while. At first I just followed Momastery. Now I follow all of her social media and I watch her videos on Youtube. There is something about a person who puts it all out there – they seem more likeable. Glennon is accessible. She tells her story completely, without editing out the parts that most people would skip. She is honest and real, and I love her writing for that reason. Melton starts the book by pointing out that we all look around us and think everyone else has it together. We feel like we need to have it together too, so we start pretending we are someone we are not. I have done it. Chances are you have done it, too. She explains, “we are not often permitted to tell the truth in everyday life.” This is why when someone asks you how you are you automatically reply “good, thanks.” We almost never tell the truth in everyday life. While I have never dealt with substance abuse, Ms. Melton tells the story of her personal history. She tells the truth about drinking, drugs and more than one unplanned pregnancy. She tells the story of waking up one morning shaking and staring at a positive pregnancy test. It was that moment that changed her life. Marriage is hard, and Glennon Doyle Melton shares the ups and downs of her own relationship, as well as that of her “Sister.” There are few people out there who can honestly tell a story about infidelity and sexual incompatibility, and the pain and struggle of the whole mess that is marriage. But this writer can. Parenting is hard. Melton states that her most important parenting job is to “teach her children how to deal with being human.” Instead of trying to make everything perfect, we should encourage our children to embrace being human. Children should be taught to forgive themselves. We should allow them (and ourselves) endless chances to begin again. This lesson of self-forgiveness is one that most mothers should also embrace. Carry On Warrior is a must read for every married woman and mother. Whether you are religious or not, Glennon’s message of total honesty is important. More women should tell their stories, and share their secrets. More women should be this kind of brave. Our friendships would be stronger. Our marriages would be more stable, and our children would be more secure. More writers should follower the example of Glennon Doyle Melton. I highly recommend her work. If Oprah likes her, and I like her, there must be something to this. Now I am chomping at the bit to get Love Warrior, her most recent release. Please, please check out her website and books! You will not regret it.